Jeff Williams, commander of Expedition 48, and flight engineer Kate Rubins successfully installed the first International Docking Adapter on the International Space Station today (Aug. 19). Two NASA astronauts successfully installed a new parking spot at the International Space Station today (Aug. 19), marking a key step toward accommodating new commercial space taxis that arrive at the orbiting lab. Jeff Williams, commander of Expedition 48, and flight engineer Kate Rubins ventured outside of the space station this morning at 8:04 a.m. EDT (1204 GMT) — one minute ahead of schedule. 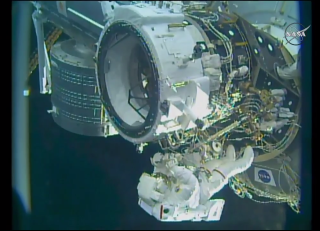 The spacewalk came to an early end at 2:02 p.m. EDT (1802 GMT) due to a minor communication problem. The spacewalk was scheduled to take about 6.5 hours. The main goal of today's spacewalk was to install a vital new piece of machinery: an International Docking Adapter (IDA). Before the start of the spacewalk, the ground robotics team used the space station's robotic arm "Dextre" to position the IDA in front of the Pressurized Mating Adapter-2 (PMA-2). A little over an hour into the spacewalk, the robotic arm released the IDA for Williams and Rubins to tether and tighten into place. During this procedure, Rubins experienced some difficulty with a "stubborn" cable connector. Williams moved around the side of the IDA to assist Rubins, and together the crew was able to securely mate the cables with the IDA. Before the IDA could be locked into place it needed to be perfectly aligned with the PMA-2. One of the ready-to-latch indicators started to toggle off and on a bit, so the crew was instructed to attach and tighten another tether. After all the cables and hook sensors were good to go, Japanese astronaut Takuya Onishi, inside the station, issued a command for the hooks to close, permanently affixing the IDA to PMA-2. Next, the two astronauts removed the IDA cover and installed two new reflectors (mirrors) that will act as the primary docking aids. These mirrors on the IDA function much like rearview mirrors on Earth-bound cars, allowing future space taxis to navigate into their new parking spot on the space station. "We've opened up a new chapter [of] the story of the International Space Station," Williams said. "Congratulations to the entire team." Williams also took a moment to wish a happy birthday to NASA Administrator Charles Bolden, who turned 70 today. Ahead of schedule, Williams and Rubins packed up their IDA tools and started work on some "get ahead" tasks. They snapped some photos of the new docking port and routed some additional cables for a second IDA, which will be flown up to the space station next year. During some additional "get ahead" tasks, the astronauts were able to route cables for a second docking adapter that will be sent up to the space station next year. Due to broken communication with Williams' right ear piece, additional minor "go ahead" tasks were called-off and the two astronauts headed back to the space station's airlock around 1:30 EDT (1730 GMT). They safely returned inside of the space station at 2:02 p.m. EDT (1802 GMT). On Sept. 1, Williams and Rubins will perform a second 6.5-hour spacewalk to retract one of the station's thermal radiators, among other tasks. Williams will return home Sept. 6 with Russian cosmonauts Oleg Skripochka and Alexey Ovchinin. Williams is set to surpass Scott Kelly's record for the most total cumulative time spent in space by an American, with a total of 534 days. Editor's Note: This article previously stated that before the addition of the IDA, only Russian vehicles could dock with the space station. That statement has been amended to clarify that currently only Russian vehicles can dock with the station; other visiting vehicles are joined to the station using the robotic arm, in a process called berthing.